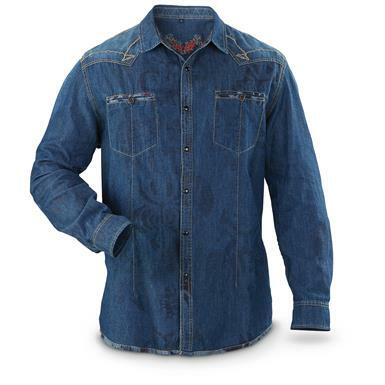 Western style in a soft and comfortable shirt. Scully® 115 Long-sleeved Shirt. Style for miles! Guaranteed to make you stand out at the honkytonk. The cotton denim tie-dye gives this shirt a rare style you just don't see. But it's incredibly lightweight, so you feel cool while burning up the dance floor. Pair it up with your dark jeans and hit the town!